Even though the 2014 Chevrolet Silverado and GMC Sierra haven’t hit dealerships around the country yet, the folks at Callaway Performance have announced plans to offer high performance tuning options for the new GM pickups with the results reaching 540 horsepower. Callaway Performance plans to introduce the production versions of the high performance GM pickups later this year and the company plans to offer packages for each of the two available V8 engines. The new EcoTec3 5.3L V8 will offer 355 horsepower and 383lb-ft of torque in standard form but with the help of Callaway’s supercharger package, those 2014 Silverado and Sierra pickups with that same 5.3L V8 will offer somewhere in the area of 450 horsepower. The new EcoTec3 6.2L V8 offers 420 horsepower and 450lb-ft of torque in standard form but Callaway expects the output to increase up to the area of 540 horsepower. Torque figures for the Callaway tuned 2014 GM pickups have not been announced but we can expect those to increase by margins that are every bit as significant as the horsepower figures. No other information on how those figures will be reached has been offered but we can expect that there will probably be some fuel system upgrades, an air intake system upgrade, high flowing performance exhaust and an ECU tune that will help to make the most of the added modifications. 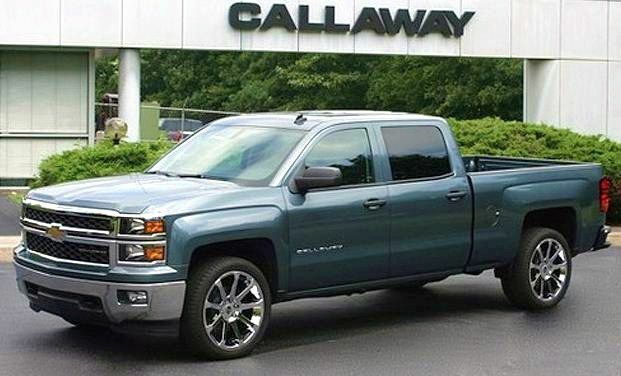 Based on the sole image of the 2014 Callaway Silverado, it looks like the Callaway tuned GMC and Chevy 1500s will wear Callaway badging on the doors and grille along with a unique set of chromed 9 spoke wheels that are probably wrapped in some sticky high performance tires. The Callaway tuned 2014 GM half ton pickups won’t receive any significant exterior modifications right now but the company is currently working on wheel/tire packages, suspension setups, interior upgrades and unique exterior packages that will likely include some new body panels to provide a more sport-truck like appearance. Callaway is also currently developing their Honker air intake and DD exhaust systems for their entire lineup of GM truck and sport utility applications. When the Callaway versions of the 2014 Chevrolet Silverado and GMC Sierra arrive, they will join the current Callaway truck and SUV lineup that includes the Chevrolet Tahoe and Suburban, the GMC Yukon and Denali and the Cadillac Escalade. Along with the full official power figures, we can expect the full pricing lists for the Callaway version of the 2014 Chevy Silverado and GMC Sierra to be made available closer to the sales launch of these high performance half ton GM pickups. While the factory sport truck segment has gotten to be fairly minimal, this has caused a boom in the aftermarket sales of go-fast goodies for the Ford, Ram and GM pickups. The Callaway 2014 Silverado and Sierra 1500 pickups will go head to head with the likes of the Hennessey Ram 1500 that offers 505 supercharged horsepower and the Roush Stage 2 Raptor that packs a whopping 590 horsepower.